German mechanical engineer Karl Friedrich Benz invented, built, marketed, and sold a three-wheel “motorwagen,” today recognized as the world’s first car. Just two years after Karl Benz applied for his patent, his wife Bertha in 1888 was the first person to drive his gas-powered motorwagen over a long distance – bringing worldwide attention…and sales. Others had experimented with electric and steam-powered vehicles. A gasoline powered engine had been placed placed on a pushcart in 1870, but is was Karl Benz who invented the modern car when he built his “Fahrzeug mit Gasmotorenbetrieb” (vehicle with gas engine) in Mannheim, Germany, in 1885. Benz applied for an Imperial patent for his three-wheeled carriage powered by a one-cylinder, four-stroke gasoline engine on January 29, 1886. The Benz patent is recognized as the world’s first for a practical internal combustion engine powered automobile. Although there had already been “auto-mobiles,” Benz used the internal combustion engine as the drive system for a “self-mover,” notes a Mercedes Benz company historian. “He presented his stroke of genius at the Imperial Patent Office – the car was born.” Since he soon built several identical three-wheeled vehicles, Benz also has been credited with first “production car” in history. It would not be long before his wife – from a wealthy German family who had earlier used her dowry to help Benz – made headlines driving his new automobile. 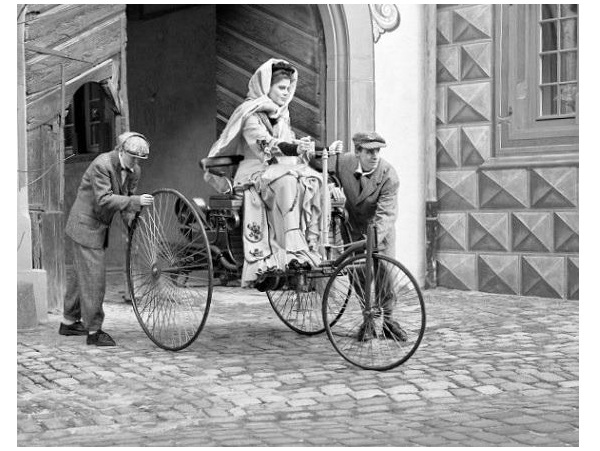 Bertha reportedly drove away with the “Model III Patent Motorwagen” without her husband’s permission, although she left a note saying she was taking their two young sons to visit her mother in Pforzheim. Her route from their home in Mannheim was about 56 miles. The drive, which included stops at apothecary shops to buy a petroleum solvent needed keep the car running, took about 15 hours. Bertha Benz was inducted into the Automotive Hall of Fame in 2016 as the first female automotive pioneer. According to Mary Bellis at About.com, five years later, in 1903, Benz retired from Benz & Company after his designs became outdated by inventions by Gottlieb Daimler. Daimler (together with his design partner Wilhelm Maybach) in 1885 had taken the internal combustion engine “a step further and patented what is generally recognized as the prototype of the modern gas engine,” notes Bellis. Karl Benz would serve as a member of the supervisory board of Daimler-Benz AG from 1926, when the company was formed, until his death in 1929. In America, Charles Duryea claimed the first U.S. patent for a gasoline automobile in 1895. One year later, Henry Ford sold his first “quadri-cycle,” creating the auto industry. By the turn of the century, about 8,000 vehicles shared mostly unpaved roads with horses and wagons. In New York City public workers removed 450,000 tons of horse manure every year. Read about a November 1900 event in Cantankerous Combustion – 1st U.S. Auto Show.